After yesterday's heat (33 degrees in London, apparently - a scorcher for the UK and quite uncomfortable - could do with a good thunderstorm to freshen the air), it was very pleasant to pop down to the veg patch in the evening (it would have been nicer if the flying ants weren't around). The beet leaves have doubled in size over the past couple of weeks so I had a bit of a poke around to see how the roots are doing and saw that one or two have grown to golf ball sized and decided to pull them. I didn't thin them this year, fully intending to lift the baby beets for eating by way of allowing the others more room to grow. (Monty D's influence, again!) I can't tell you which ones are which because, having planted three varieties in straight lines, a fox (probably) rummaged in the bed, scattering the seeds whilst digging. The bright pink globes I know are Chioggia which have beautiful pale and dark pink rings. The others could be Cheltenham Greentops or Perfect 3. I'm leaning towards the Cheltenham because of the position in the raised bed, but I really wanted to do a taste test on the fully-grown vegetable and now won't know for sure; I wonder if I re-sowed now whether the crop would mature by autumn? At first there was little to see - some pond skaters and water boatmen, a few ripples and bubbles from under the water - but finally our patience and whispering were rewarded. This little guy floated up to the surface long enough for me to take a snap, before he slowly swum away and submerged. I think it will be a few more weeks before any frogs are seen as he hasn't begun to get legs yet but the visit gave me the perfect excuse to stop whirling and lie still in this tranquil spot to watch and listen. Curious how the pond always seems to be a place of calm while the rest of the farm goes about its busy working day just a few metres away. Now I've just got to whirl down to the Veg Patch as it's almost July (where did June go?) and I need to do another veg patch overview. P.S. More City Farm photos on Flickr and, in case you're wondering, I'm crocheting a granny square blanket, precisely because I can squeeze in a few stitches every now and then! The weather here in North London over the last few days has been, on the whole, overcast grey skies yielding to heavy rain or drizzle. Sunshine has been rare or fleeting which makes me think that either they're having wonderful weather in the Midlands or that Gardeners World Live, held at the NEC in Birmingham and screened on BBC2 last night, was filmed earlier in the week - say, on Tuesday, when the sun shone for most of the day. Yesterday was another on/off rainy day here and, as I meandered around the veg patch, the brilliant pop of colour provided by the cherries and strawberries really caught my attention. The cherries appear to colour up more each day and, as I weeded around the base of the trees, a cheeky sparrow crept up to peck at the fruit. Definitely time to get the nets out. (Overdue, I know!) It was starting to rain more heavily so I nipped home for my jacket and grabbed my camera at the same time. So this is a Friday-Saturday Snap, it being too windy to photograph the heads of my fennel this morning. Hope it cheers up the weekend for you all! Don't be fooled by the tempting appearance of these fruits - Morello Cherries are sour and best for making pies and jam. I made the mistake of eating one last year - most unpleasantly, it really was sour! "Over the years I have travelled down the country rather like a sock slips down inside a wellington boot. ... I have found one universal truth that binds all productive gardeners - none of them like to spend any money! ... In this modern society we're so conned into believing we need money to do anything, yet in other cultures around the world where there is no money, people improvise and make do with what they have." 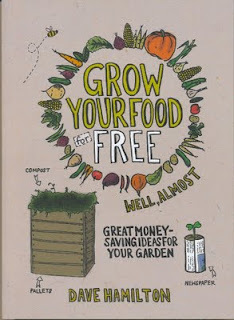 So says Dave Hamilton in the Final Words to his book 'Grow Your Food for Free'. I apologise for the delayed review of this book, it should have been done weeks ago. Trouble is, every time I pick up the book meaning to speed read it for the review, I get completely caught up in it because it's so good. 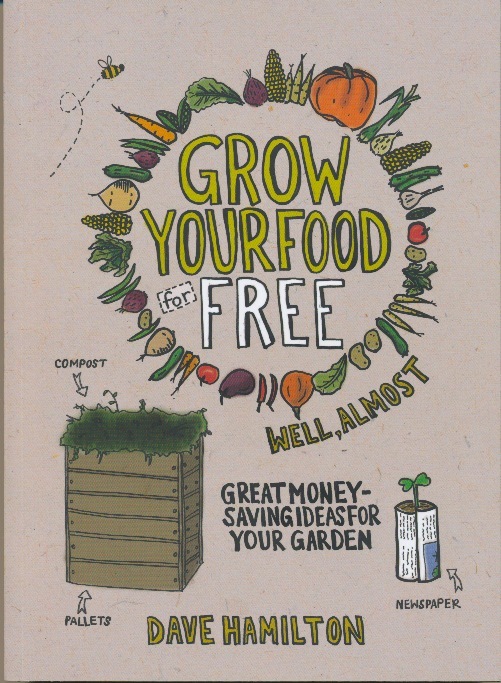 The book is sub-titled 'Great money-saving ideas for your garden' by Dave Hamilton (who also co-wrote The Self-Sufficientish Bible with his brother Andy). So it's less about how to grow veg and more about avoiding spending lots of money by retraining your eye to reassess and reuse what you already have. Surely a subject dear to the heart of many an allotmenteer? Please don't think that the growing, harvesting, storing and cooking of food, whether grown or foraged, is not addressed; the book is sprinkled throughout with tips on propagating, planting out, protecting your seedlings, pests and diseases, drying, storing and using. 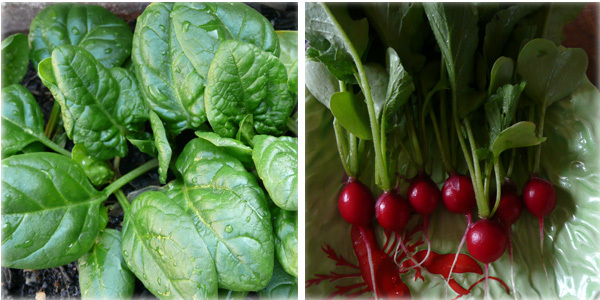 Do you know how to get an extra harvest from your home-grown veg? Reams of seriously practical advice draw on Dave's long experience as a forager and food grower; this advice is particularly helpful to both short-term tenants who may only have access to their growing space for one or two seasons and to new (and very practical) allotment growers who may be contemplating spending money on tools, seeds, composter, shed, etc. Because of Dave's self-sufficient background, there's a fair bit of information on gathering food in the wild which won't appeal to everyone. Other information such as building a shed from pallet wood might not be taken up but how to dismantle a shed (should you be lucky enough to be given one on, say, Freecycle) is invaluable. There's a lot of information packed into its 240 pages - and clear illustrations and photos on almost every page - but, whether dipping in and out, or reading straight through, it's like having a knowledgeable gardening neighbour chatting over the fence, fast-tracking you to the good stuff. An excellent read. It's available now from all good booksellers. Published by Green Books in Devon and printed in the UK on 100% recycled paper. One advantage to starting off now is that you may find a few of the seed companies (and supermarkets) are selling their seeds at a discount, but you have to be quick. Thompson and Morgan send out a newsletter with their special offers, worth signing up for as they recently had 50% off all seeds, too late for a mention here as that offer has finished. Also sign up to UK Veg Gardeners (it's free), join the Freebies and Bargains group and get alerted to any special offers as the members find them. I'd highly recommend Sweet corn, if you have room - baby corn or popping corn if space is an issue - it's so much tastier cooked straight after picking; Stephen Shirley of Victoriana Nurseries gives the inside deal on growing it here on YouTube. Fennel bulb, beetroot, french beans and peas can be sown outdoors now. Pea shoots can be grown in a window box or kitchen flowerpot and harvested within a couple of weeks as a tasty addition to a salad (as I'm sure all fans of Alys Fowler's Edible Garden programme will know!) - and you don't need special seeds, buy a pack of Bigga dried peas from the supermarket, they'll do the job. And what about marrows and courgettes, perfect time to sow these straight into the ground. Courgette flowers (the female flowers with the fruit just forming behind) can be picked, stuffed and deep fried while the courgette continues to grow - the plant does get quite big but you can grow stuff around it, such as spinach, lettuce, herbs or nasturtium flowers (edible!). Could you squeeze in some squashes? I fancy Sweet Dumpling squash; a pretty striped small winter squash, cook it whole and stuffed to enjoy it's sweet and tender orange flesh. Seeds should have gone in in May but nature catches up with itself, so it's worth giving it a go. Try training small squashes up a trellis, tying it in with soft ties as it grows and making sure to support the fruits as they develop. And lets not forget winter veg: mini cauliflowers, purple sprouting broccoli, asparagus for next spring (I'm planning to sow seed for Romanesco cauli aka broccoli when the rain stops). Providing they don't bolt, seeds sown in July will overwinter (it worked for me last year) and make a delicious meal in the spring with some cheese sauce over the top, or add to a stir-fry. Lastly, try and find a space between other veg for herbs: I can't do without parsley, thyme, oregano, coriander, mint and rosemary being readily available as I'm hopeless at planning ahead with buying herbs. (See my last post for a link to Monty Don planting herbs on Gardener's World.) Shop bought herbs won't last long if left in their pots as the seeds are overcrowded but garden centre herbs planted in a bed with space to grow will last you throughout the summer, and probably reappear next year - a much better investment! I hope this has provided some inspiration, for Ana and for anyone else reading who may be feeling a bit overwhelmed by choice. If you enjoy veg growing, it's well worth reading books on the subject from the library. 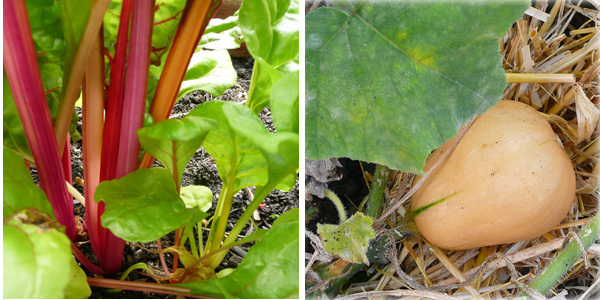 Alan Buckingham's Allotment Month-by-Month is a good one, as in anything by Joy Larkcom. 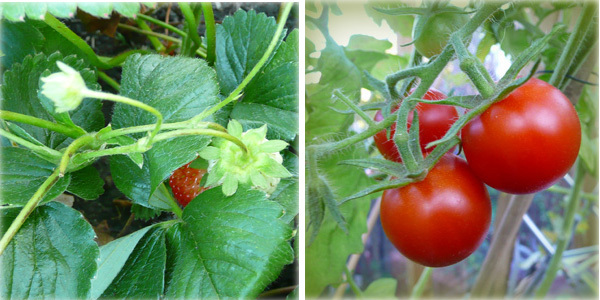 You Tube fans might like to check out Claire's Allotment for her excellent how-to videos. Due to the rain, I was back indoors in time for Gardener's World yesterday evening. I don't watch it regularly but last night's was jolly good with Monty in his herb bed, dispensing good advice about which herbs will happily grow together, i.e. get the soil type right, one size does not fit all. I particularly liked how to tell the difference between french and russian tarragon, especially as I've just bought a tiny (labelled-as-french) tarragon plant. Carol Klein pottered around her beautiful garden at Glebe Cottage, gathering seed from Hellebores and taking softwood cuttings from a Black Elder (Sambucus nigra) shrub and honeysuckle. (I didn't know you could do that with hellebores.) Catch up with it on BBC iplayer. I've just been outside to see if I could find any seed to gather from the hellebores in the Secret Garden below my windows but, sadly, the rain has made the flowers mushy and all the seeds have already dropped. I'm probably a week too late but I'd hoped to photograph the seeds still attached to the flowers for today's Snap. The photo feels so bright and sunny even though there are currently black clouds looming, it's going to be one of my favourites and looks lovely as a desktop background! If you want to see the others, go to my Flickr page (link on the right). I'm not sure how this works, but I think you can also download the photo to your own desktop (if you want). Tomorrow's forecast is for rain ALL DAY so I'm off to put out tubs and containers to catch the water (good for the blueberries) and to get some more seeds sown. I seem to remember parsley doing particularly well a couple of years ago, sown just before a downpour. So, during a visit to a well-known home'n'garden centre to pick up more potting soil, I found myself examining the labels in the tomato section ... and picking up a couple of sturdy, leafy plants to bring home. (Nice to see that said emporium has embraced Heritage toms.) I bought rescued a vine tomato called Auriga (looking very abandoned and sorry for itself) and another Heritage tom "Tornado" - although whether I'm the best person to nurture these plants, based on previous form, remains to be seen! Where time moves at a slower pace. Away from all the noise and bustle. Ah, yes, my sentiments exactly.